had begun by practicing black magic and the administration of blood oaths had degenerated into the most violent sorts of barbarism. The Mau-Mau weapon of choice was the panga, the broad-bladed machete commonly used to hack a path through thick jungle vegetation. The society appeared to favor bloody and brutal attacks as a means of striking fear into the hearts and minds of all who might oppose them, but their choice of enemies seemed often difficult to comprehend. The first man to die at the hand of the Mau-Mau was a Kikuyu chief who spoke out against the secret society that had chosen to resort to savagery and barbarism to achieve its political objectives. In October 1952, a lone white settler was killed and disemboweled. An elderly farmer was found dead in November; in January 1953, two men who worked a farm as partners were discovered murdered by the Mau-Mau. A vicious attack on January 24, 1953, claimed the Rucks, a family of English heritage, who had always been regarded as dealing with their black employees in a fair-minded and charitable manner, even to the extent of supporting a clinic at their own expense. The bodies of the husband, wife, and their six-yearold son were found so hacked and ripped as to be nearly unrecognizable as human beings. Later it was learned that native men and women who had been in the Rucks' employ for many years had been foremost in the slaughter of the English family. What seemed particularly insidious to the white population was discovering to their horror that employees who had been loyal to them for decades were suddenly rising up and butchering them without warning. When the Mau-Mau demanded that blood be shed, long-standing associations and friendships between black and white were no longer considered something of value. Such unprovoked butchery as that exhibited toward the Rucks had the white farmers watching their employees apprehensively and preparing for another brutal attack on their isolated homes. But the next violent raid occurred on March 26, 1953, against the police station at Naivasha. The station was overrun and guns and ammunition were taken away in a truck. Later that same night, the Mau-Mau bound the circular huts of the villages of Lari with cables so the doors could not be opened, poured gasoline over the thatched roofs, and set the homes on fire. Most of the men of the village were away serving in the Kikuyu Guard, an anti-Mau-Mau force, so the greatest number of the 90 bodies found in the charred remains were those of women and children. In addition, the Mau-Mau had mutilated more than 1,000 of the villagers' cattle as further punishment for opposing them. As nearly as it can be determined from the vantage point of an historical re-examination of events, the Mau-Mau was quite likely an ancient Kikuyu secret society that was reactivated. The Kikuyu tribe was the most populous and educated in Kenya, but their culture also permitted secret societies to flourish, and there were many such groups that had been in existence since long before the Europeans came to Africa. The Mau-Mau leaders invoked the old secret society in order to stir up the Kikuyu tribe to support their demands for independence and for the return of the Kikuyu land that the whites had stolen over the years. What was ignored by the society's leaders was the fact that the land occupied by the European settlers had long been designated a kind of buffer zone between the Kikuyu and their traditional enemies the Mazai tribe. 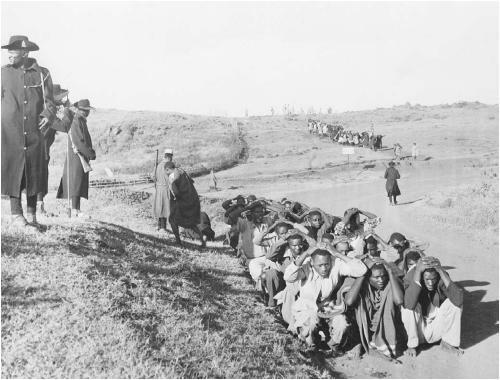 The ranks of the Mau-Mau increased when they began to force many unwilling individuals from other tribes into participating in their blood oaths. The oathing ceremonies began with the new members taking a vow to honor the old religion of their tribal ancestors. There were at least seven stages of oath-taking, which might take several days or weeks to complete and which included the drinking of blood, eating portions of human flesh, cohabiting with animals, and ingesting bits of brains from disinterred corpses. After the seventh stage of the oath-taking had been reached, the members had to repeat the cycle and reinforce their vows by beginning again. No man or woman was exempt from this requirement, not even the leaders of the society. The Mau-Mau reign of terror was broken by groups of white settlers who joined the auxiliary police and army units who had combined forces with ex-terrorist Kikuyus. The former Mau-Mau members were provided with small arms and grenades, and they, in turn, taught the whites how to move silently through the thick under-brush. In May 1956, Dedan Kimathi, who was identified as the militant head of the Mau-Mau, was captured by a party of Kikuyu tribal police. Soon after Kimathi had been apprehended, the Mau-Mau society crumbled from lack of ammunition and arms, internal quarrels in the ranks, and disease brought about by the hardship of existing in the jungle under extremely difficult conditions. By the time the Mau-Mau was disbanded, they had slaughtered more than 2,000 African tribespeople and brutally maimed many thousands more native people. Although the murders of Kenyan civilians of European ancestry were brutal and bloody, the actual numbers of those killed at the hands of the Mau-Mau were greatly exaggerated by the media. Actual deaths of white settlers attributed to the Mau-Mau insurrectionists have been listed as low as 32 to 57, to as high as less than 100. Dedan Kimathi was executed by the British in 1957 for having ordered atrocities and murders as the leader of the Mau-Mau. The Kikuyu Central Association, the political party that fronted for the secret activities of the Mau-Mau, was headed by Johnstone Kamau, better known as Jomo Kenyatta (1892–1978). Under his leadership, Kenya gained independence in 1963. Malboa, Wunyabari O. Mau-Mau and Kenya: An Analysis of a Peasant Revolt . Bloomington: Indiana University Press, 1998. Roseberg, Carl G. The Myth of Mau-Mau. New York: Meridian, 1970. Warwick, Mark. "Mau-Mau: Messengers of Misery." [Online] http://www.multiline.com.au/~markw/maumau.html. 21 December 2002. I am a Kenyan native and a kikuyu for that matter. I worked on the subject of 'Mau Mau' for my final project in college this past spring. Apparently I could not find the true meaning of Mau Mau but most recently my mother told me that 'Mau Mau' was a reverse or mix of the statement 'Uma Uma'. which means 'get out, get out'. As though to tell the British to get out. The word 'Mau Mau' is also said to mean in Swahili 'Muzungu Aende Ulaya, Mwafrica Apate Uhuru' which in translation means, "let the white man go back abroad so that the African can get his independence." I thought that was interesting. Mau means Bad in Portuguese....Mau Mau is said to children when they did somehting bad. NOW as in most of World History the Discoverers of the World especially Africa and New World are ignored by trying to Credit the Spanish, British and Dutch with Portuguese works. Portuguese were the first Europeans all over Africa, by over 100 yrs. Portuguese were in Americas, Australia, Asia etc. before any Europeans by over 100 yrs. Reminds me of the Dighton Rock and Newport Tower explanations, where for centuries no one ever thought of seeing if it had a Portuguese explanation and low and behold it does. Portuguese were in USA over 100 yrs before the Pilgrims. Google Miguel Corte Real, Newport Tower and Dighton Rock which pre-dates Plymouth Rock by over 100 yrs. MAU MAU comes from Portuguese meaning Bad Bad. Like when someone did something wrong (especially children)and needs to be punished and Tau Tau (spanking) is usually the punishment.